What Could Have Been: Max Headroom Season 2.5? Animation? The Max Headroom Movie? Earlier this month I introduced Max Headroom, the fictional show starring the computerized celebrity of the same name. 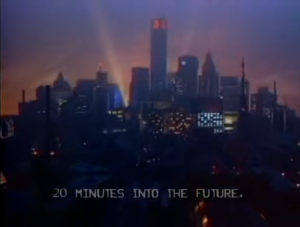 If you’ve read that you know I had a pretty high opinion of the series itself, a fine example of 80’s cyberpunk on its own and one of the only TV programs to venture into that territory at the time. However, it seemed the world wasn’t quite ready for the dystopian adventures of Max, and the show met with cancellation after two exceptionally short seasons. Production was still in full swing at the time, though, so what did we miss out on by this abrupt ending? or Max Headroom season 3? 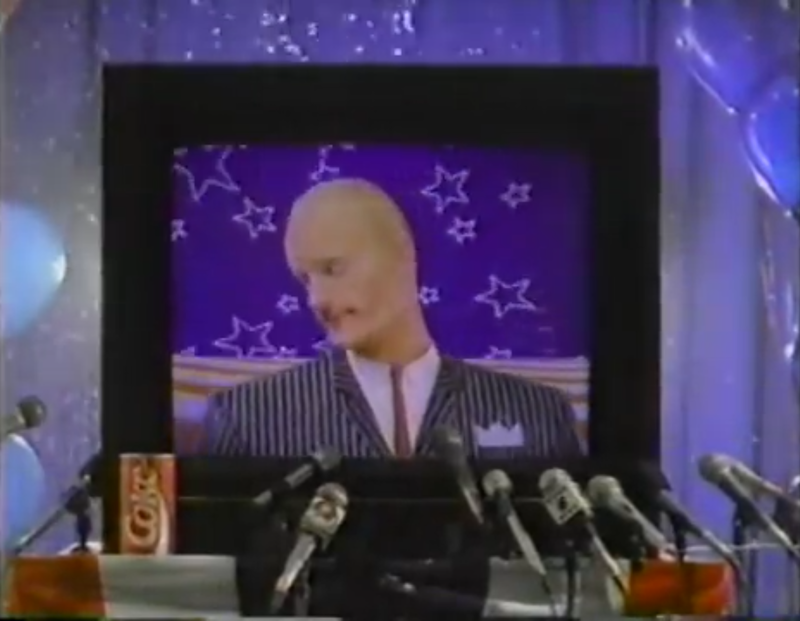 And hell, even in spite of the cancellation, their plans for Max’s world weren’t done–a Max Headroom theatrical movie, anyone? The ninth episode, “Families,” was being filmed when the news came in and as a result was not completed. “Families” was about “an ironic study of the television ratings system,” wherein the networks of Max’s world had pared down the numbers necessary to test shows to a ridiculously few, essentially rendering all programming preferences to those of a handful of families. This obviously plays off the concept of the “Nielsen family” and is a perfectly brilliant subject for Max Headroom to tackle. So far as anyone knows, it seems that no surviving footage of the incomplete episode exists, which is a real shame. On the other hand, weirder things that have been lost for far longer have resurfaced before, so it’s not impossible that someone out there has pieces of it in some form. The completed script of the tenth episode, “Theora’s Tale,” was leaked (is that the right word to use in this case?) and can be found online. To quickly summarize, Edison Carter’s controller, Theora, gets kidnapped by a group called the “Video Freedom Alliance” around the same time that fighting starts to break out between the Yakuza-owned megacorp Zik Zak and a competitor called Zlin… in Antarctica. And we’re talking an actual war here, with weapons, between corporations. As the title implies, it dives into Theora’s background and reveals her father’s identity. You can read a full act-by-act summary of the script here. The next episode, in alleged production order, was called “The Trial” and has very little known aside from that title. And believe me, I dug hard on these. The title’s so generic it may well have been a working title, and it doesn’t give us much to go on as to the episode’s contents; for what it’s worth, the first episode of season 2, “Academy,” also dealt with the trial of Blank Reg, and had the same writer (David G. B. Brown) as this episode supposedly had. Was this a misunderstanding or mix-up of some kind that’s been perpetuated? Does “The Trial” exist at all? Can’t say for sure. After that comes “X-mas,” sometimes rendered as “X-max,” either of which is a believable title for this show. The increasingly consumerist nature of Christmas is another natural target for a show like Max Headroom, especially in a world where advertising is a life-or-death business. “We came up with the holiday, “Xmas,” in which everybody gathers around the TV and home shops. The person in the family or the community that home shops the most is the one who celebrates Xmas the best,” as Michael Cassutt, a writer on the show, described it. Max had done Christmas specials on his talk show as well, with the weirdly named “Max Headroom’s Giant Christmas Turkey.” By far the most noteworthy thing about this episode is who wrote it: George R. R. Martin, of A Song of Ice and Fire/Game of Thrones fame. Kind of a bizarre thought, isn’t it? The last known episode has two names: “Bring Me the Head of Network 23” and “Nanosurgery,” the latter being a much more typical episode title for Max Headroom. This is another one where we’ve basically just got the episode title to go on. I also found out about the existence of a mystery episode that was nixed by ABC for being “too disturbing.” No points for guessing that George R. R. Martin wrote this one, too. Might it have eventually been developed… or could it have been the original episode slated for “The Trial”‘s slot? While digging for more evidence of this, I found out there’s a document in the Texas A&M University’s George R. R. Martin collection entitled “Max Headroom Meets Mister Meat.” Is this the same lost episode idea? The X-Mas draft seems to be here as well. If you have any chance of gaining access to the collection, please let me know and maybe we can uncover a lost piece of sci-fi history! Another long-standing rumor is that William Gibson, one of the creators of cyberpunk and author of Neuromancer, was going to write an episode for the show. While it’s true he was a fan of Max, this rumor has been refuted by people involved in the show on several occasions. Well, the idea never became a movie, but it did end up as a Coke commercial. Now, when the show was canceled, that wasn’t it for Max, as far as plans go. To capitalize on his remaining popularity and the upcoming 1988 presidential election, the plan was to whip together a theatrical movie to finish off Max’s story. The title that floats around is Max Headroom for President, which is pretty self-explanatory, really, and the thinking behind it was equally simple: “There was an actor who was president… why not a computer-generated man?” as Matt Frewer himself put it. We do see how elections work in Max’s world from the show, based primarily on ratings of each channel corresponding to a candidate, so it’s not clear how that would work in the context of this movie. Supposedly the deal was in the final stages with Warner Bros. when the 1988 writer’s strike took place and destroyed any hopes of getting the movie out on time. As a result, it was never made, and Max’s descent into obscurity began. Additionally, an animated series was apparently considered at one point, but there’s literally only one source for that. Nothing more than this one mention, but I haven’t seen any reference to this actual 1987 article before, either. That’s it for this month’s What Could Have Been. Would you have preferred getting to see these remaining episodes of Max Headroom, or are you okay with where it ended? Would you rather have jumped straight to a movie, or gotten Max Headroom season 3? Do you have a show you’d like me to dig up the lost plans for? Leave a message in the comments, or send a tweet to @RetroPhaseShift. If you enjoy these and want to know when the next one’s out, you can also subscribe to the “What Could Have Been” RSS Feed here. Do share the article anywhere you think it will be appreciated, and please–if you can get into the Texas A&M library, let me know! that is some impressive research! That is awesome! I’m so psyched to hear that. I really hope some of that makes it online. Of all the shows I’ve reviewed for the Primer, Max has stuck with me the most. It’s funny to see that even GRRM sees it as a lost opportunity. Thanks for sharing.